Many establishment types in both the Republican and Democratic parties seem to think that Donald Trump and Bernie Sanders are anomalies. That goes double for the Republican Party establishment class that thinks their money can control things. Trump is not an anomaly; he is a harbinger of a growing frustration that is bigger than corporate donors and super PACs. Those three categories encompass maybe (being generous) 30% of the population. I should point out that many of the protected were once unprotected.. 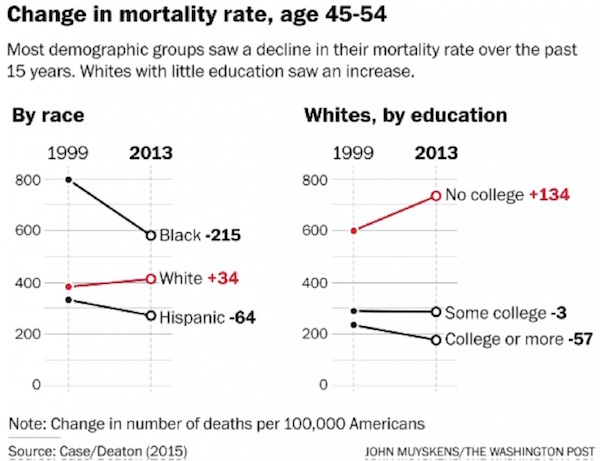 I certainly spent the first 35 years of my life in the unprotected class. I know what it’s like to wake up at 2 AM with your stomach in a knot as you try to figure out how you’re going to make your little two-person payroll, pay the electric bill before they turn you off, get enough gas in the car to make it to your first sales call – and wonder how you’re going to get one of your clients to pay you early so you can do all these things. You wouldn’t even know it to look at my tax return. I am nowhere near rich, but I have typically made a solid middle- or even, at times, upper-middle-class income, which is about all a writer can expect, even a writer who also teaches and lectures and writes television scripts, as I do.. And you certainly wouldn’t know it to talk to me, because the last thing I would ever do – until now – is admit to financial insecurity or, as I think of it, “financial impotence,” because it has many of the characteristics of sexual impotence, not least of which is the desperate need to mask it and pretend everything is going swimmingly. In truth, it may be more embarrassing than sexual impotence. 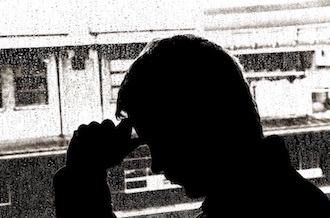 “You are more likely to hear from your buddy that he is on Viagra than that he has credit-card problems,” says Brad Klontz, a financial psychologist who teaches at Creighton University in Omaha, Nebraska, and ministers to individuals with financial issues. “Much more likely..” America is a country, as Donald Trump has reminded us, of winners and losers, alphas and weaklings. 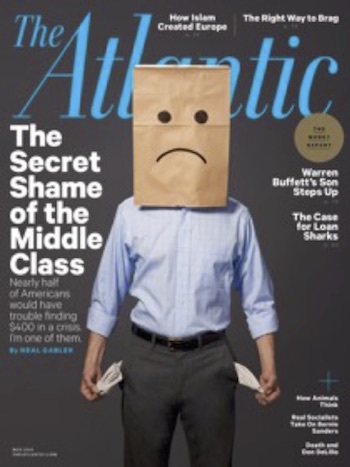 To struggle financially is a source of shame, a daily humiliation – even a form of social suicide. Silence is the only protection. As bad as the situation is, official data says it’s improving.. Just look at the unemployment rate, down to 5% and job openings everywhere. While central bankers try to create inflation, for the unprotected inflation never disappeared. If Boston reflects other cities, we can see why people complain about rent and sleep on each other’s couches. This kind of steep climb in the cost of living is very hard on people who have little income to spare..
On one of my first trips to China in the early 1990s, on the drive from Beijing airport, I remember gazing out at hundreds of workers labouring with little more than shovels on a new highway snaking its way through farmland towards the capital. By the time the Olympics came to the city in 2008, the road had been joined by a second expressway and China had grown into the world’s largest construction market. Last year, it completed the world’s second-highest building: the Shanghai Tower, 632m of luxury offices, designer shops and a high-end hotel. But there is a bit of folklore about the topping out of skyscrapers: the builders’ ceremonial placing of the final beam often heralds the onset of grim economic news, coinciding with the end of a credit cycle that has funded a frenzy of lending for ever-bigger projects. And indeed, as the economy slows markedly, China is increasingly dependent on credit creation. The share of total credit in the economy is approaching 260 per cent and, on current trends, could surpass 300 per cent by 2020 — exceptional for a middle-income country with China’s income per head. The debt build-up must sooner or later end — and when it does it will have a significant impact on the global economy. Back in 2008, as the western financial crisis spread, China tried to insulate itself with a big credit stimulus programme to counter factory closures and an accompanying return of millions of migrants to the countryside. By 2011 the growth rate had peaked. Its decline was led by a fall in investment in property, then manufacturing. Subsequent stimulus measures have not al­tered the trend for long — but one constant is a relentless build-up in the in­debtedness of property companies, state enterprises and local governments. Conventional measures of credit, however, do not fully reflect the growth of total banking assets. Local and provincial governments have been allowed to issue new bonds on yields a bit below bank loans, bought by banks — but they have not paid down more expensive earlier debts to banks as planned. Banks, moreover, have also increased their lending, often through instruments such as securitised loans, to non-banking financial intermediaries, such as insurance companies, asset managers and security trading firms. When this is taken into account, credit growth is probably running at about 25-30 per cent, or about twice as fast as official data suggest, and roughly four times the growth in money gross domestic product, the cash value of national output. For now, China’s credit surge seems to have stabilised the economy after a sharp slowdown around the turn of the year. The property market has picked up, attracting funds from a stock market that has fallen out of favour with investors after pronounced instability in the middle of last year and early in 2016. The volume of property transactions has risen and prices have re­bounded, especially in the biggest cities. Timing the end of a credit boom is more luck than judgment. There is no question that lenders own bad loans, reckoned unofficially by some banks and credit rating agencies to amount to about 20 per cent of total assets, the equivalent of around 60 per cent of GDP. These will have to be written off or restructured, and the costs allocated to the state, banks, companies or households. Yet in a state-run banking system, where loans can be extended and there are institutional obstacles to realising bad debts, the day of reckoning can be postponed for some time. More likely, the other side of the lenders’ balance sheets, or their liabilities, is where the limits to the credit cycle will appear sooner. Loans have to be funded by deposits, and China’s banks are venturing beyond fairly stable household deposits to more volatile funding sources in the shadow finance, interbank and corporate markets and overseas. Growing dependence on these liabilities renders the banking system, and the economy as a whole, more vulnerable to withdrawals that are prone to happen suddenly or when lenders lose confidence in economic and financial stability, as we know from 2008. For the foreseeable future, China’s neglect of the problem of excessive debt growth looks likely to continue. Beijing cannot afford to spark a disruptive end to the credit boom and a slump in investment, with anecdotal signs of rising labour unrest and unemployment — especially before next year’s 19th party congress, where President Xi Jinping plans to consolidate his support at the upper levels of the Communist party. The question, then, is whether the politics of debt control will shift after the congress. With a slowing economy and rising financial instability risks, it is hard to imagine Beijing making a strong commitment to cut credit dependency and impose debt management policies such as more defaults and write-offs, the sale of national assets, and the transfer of wealth from indebted state companies and local authorities to private sector households and creditors. Yet, without such a shift, China is likely to experience greater financial turbulence than it has seen recently, which may not happen by the end of this year but will not take three years either. The main outcome would probably be a growth hiatus of unknown duration, for which the rest of us need to be prepared. 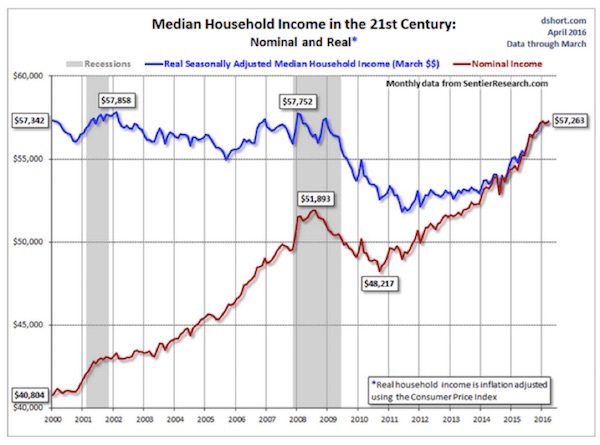 The "data dependent" Fed is going to have to deal with new economic data. 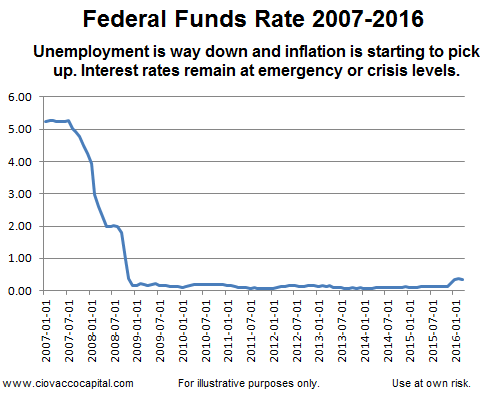 How do things look relative to the Fed's stated targets on unemployment and inflation? Can the Fed wait indefinitely on rates? In terms of government policy, the economy has two primary types of stimulus, fiscal and monetary. The Fed controls monetary policy. Congress is the primary driver of fiscal policy. In recent years, Congress has left all the heavy lifting to the Fed. Having stated the Fed is in a difficult position, their focus in recent years appears to have shifted almost solely to keeping asset prices (NYSEARCA:VOO) propped up, a concept that has not gone unnoticed by the financial markets (NYSEARCA:VTI). The Federal Reserve on Wednesday agreed to keep a key short-term rate near zero until the 7.7% unemployment rate is 6.5% or lower. The chart below shows the unemployment rate between 2012 and 2016. 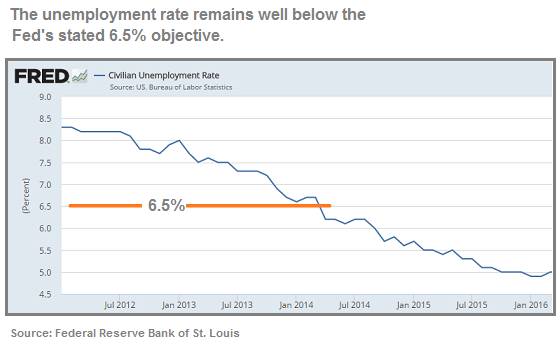 As you can see, unemployment has been below the Fed's 6.5% target for some time. Rather than face the difficult decision to begin raising interest rates, the Fed kicked the can down the road after calling their own stated unemployment target "outdated", which begs the question if the target is outdated, then why did the Fed use it in the first place? Did the 6.5% target somehow become outdated between 2012 and 2014? The Federal Reserve signaled Wednesday that it needs to see further improvement in the job market and higher inflation before it raises interest rates from record lows. Federal Reserve Chair Janet Yellen said Tuesday that the U.S. economy is making steady progress, but that for now the Fed is will remain patient about raising interest rates because the job market is still healing and inflation is too low. The median U.S. worker is enjoying their highest wage growth since 2009, according to the Federal Reserve Bank of Atlanta's wage growth tracker. This metric showed that the median employee saw pay rise 3.4 percent year-over-year as of April, setting a new record for this expansion. Inflation in the U.S. has picked up in recent months, toward the top end of Federal Reserve forecasts. While several Fed officials remain focused on building inflationary pressures, Fed Chair Janet Yellen has recently struck a dovish tone, stressing her concerns about global growth and financial conditions as reasons to proceed cautiously with interest-rate hikes. Can markets see the difference between the Fed's stated/mandated objectives and their actions? If we look at trading volume for the SPDR S&P 500 Trust ETF (NYSEARCA:SPY), the answer seems to be a definitive yes. Three-month average daily volume for SPY for May-July 2010 was 283,000,000 shares. Average daily SPY volume for August-October 2011 was 322,000,000. Current average daily volume for SPY going back three months is just 99,000,000, based on data from Yahoo Finance. Trading volume helps us better understand investor interest in a particular market. Using SPY volume, investor interest in the stock market has dropped by almost 70% since 2011. Obviously, there are countless factors impacting investor interest/trading volume, including fundamentals. When we examine valuations, it is most likely a combination of markets that seemingly get talked up by the Fed every time they begin to fall and extended valuations that have resulted in a sharp decline in investor interest at current S&P 500 levels. According to FactSet, the forward P/E ratio for the S&P 500 is higher today than at the 2007 Financial Crisis peak in the stock market. The Fed's seemingly never-ending period of near-zero interest rates has also led to an alarming amount of debt relative to earnings. 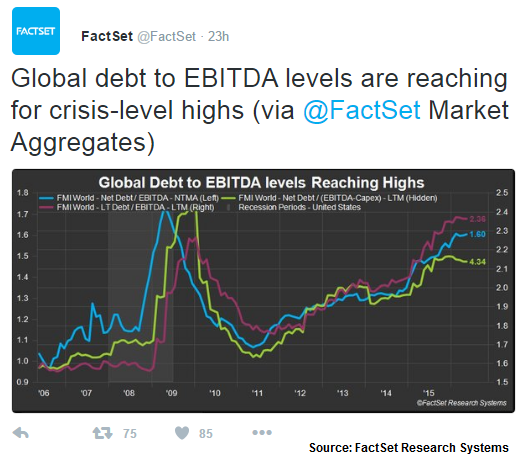 The tweet below is from FactSet (EBITDA stands for earnings before interest, tax, depreciation and amortization). Interest rates are too low for today's economic conditions, creating risks for the outlook, said Kansas City Fed President Esther George on Thursday. "Because monetary policy has a powerful effect on financial conditions, it can give rise to imbalances or capital misallocation that negatively affects longer-run growth," George said in a speech to business leaders in Albuquerque, New Mexico. Low rates can cause interest-sensitive sectors to take on too much debt and grow quickly, only to unwind in ways that are disruptive, George said, citing the housing crisis and the "current adjustment in the energy sector." George is a voting member of the Fed's policy committee. She has dissented at the last two policy meetings in favor of hiking rates. Legendary billionaire investor Stanley Druckenmiller told Sohn Investment Conference attendees to sell their equity holdings Wednesday. The billionaire investor expressed skepticism about the current investment environment due to Federal Reserve's easy monetary policy and a slowing Chinese economy. "The Fed has borrowed from future consumption more than ever before. 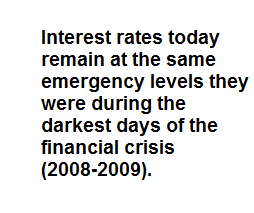 It is the least data dependent Fed in history. This is the longest deviation from historical norms in terms of Fed dovishness than I have ever seen in my career," Druckenmiller said. "This kind of myopia causes reckless behavior." A recent article outlined numerous "are they really doing that" policies being implemented by other central banks around the globe. As noted in a May 2016 video, the Fed's dual mandate, and more importantly basic economic principles, tell us central banks will try to inflate as long as they possibly can. When inflation starts to become a problem on the high end of the price stability spectrum, it will be much harder for central banks to keep things propped up. A continuation of extremely dovish and radical policies from global central banks (see article regarding possible expansion of stock purchases). The possibility of asset prices remaining artificially elevated, including the scenario of U.S. markets pushing to new all-time highs. "Because monetary policy influences real activity with a substantial lag, we should not wait until inflation is back to 2% to begin tightening." 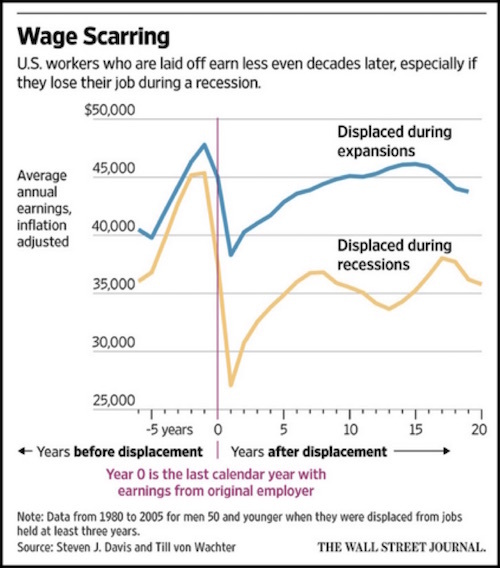 The latest read on inflation was a wage figure that represented the highest wage growth since 2009. Meanwhile, the Fed continues to wait.